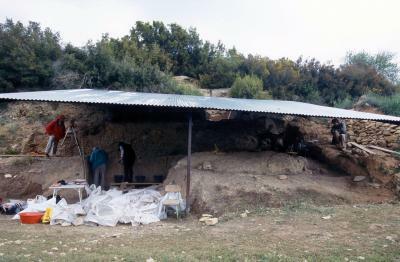 This shows Moll's Salt site in Tarragon (Cataluña, Spain). Credit: M. Vaquero et al. The recycling of stone tools during Prehistoric times has hardly been dealt with due to the difficulties in verifying such practices in archaeological records. Nonetheless, it is possible to find some evidence, as demonstrated in a study published in the 'Journal of Archaeological Science'. "In order to identify the recycling, it is necessary to differentiate the two stages of the manipulation sequence of an object: the moment before it is altered and the moment after. The two are separated by an interval in which the artefact has undergone some form of alteration. This is the first time a systematic study of this type has been performed," as explained to SINC by Manuel Vaquero, researcher at the Universitat Rovira i Virgili. The archaeologists found a high percentage of burnt remains in the Molí del Salt site (Tarragona), which date back to the end of the Upper Palaeolithic Age some 13,000 years ago. The expert ensures that "we chose these burnt artefacts because they can tell us in a very simple way whether they have been modified after being exposed to fire." "This indicates that a large part of these tools were not conceived from the outset as double artefacts but a single tool was made first and a second was added later when the artefact was recycled," outlines the researcher. The history of the artefacts and the sequence of changes that they have undergone over time are fundamental in understanding their final morphology. According to Vaquero, "in terms of the objects, this is mostly important from a cultural value point of view, especially in periods like the Upper Palaeolithic Age, in which it is thought that the sharper the object the sharper the mind." "It bears economic importance too, since it would have increased the availability of lithic resources, especially during times of scarcity. In addition, it is a relevant factor for interpreting sites because they become not just places to live but also places of resource provision," states the researcher. Reusing resources meant that these humans did not have to move around to find raw materials to make their tools, a task that could have taken them far away from camp. "They would simply take an artefact abandoned by those groups who previously inhabited the site." Vaquero and the team believe that this practice needs to be borne in mind when analysing the site. "Those populating these areas could have moved objects from where they were originally located. They even could have dug up or removed sediments in search of tools," highlights the researcher. Manuel Vaquero, Susana Alonso, Sergio García-Catalán, Angélica García-Hernández, Bruno Gómez de Soler, David Rettig, María Soto. "Temporal nature and recycling of Upper Paleolithic artifacts: the burned tools from the Molí del Salt site (Vimbodí i Poblet, northeastern Spain)" Journal of Archaeological Science, 39: 2785 – 2796, 2012.